In preparation for the Higher Learning Commission Peer Review Team visit scheduled from February 29 – March 3, the HLC Steering Committee will hold two Open Forums for members of the campus community. Although a broad overview of the accreditation process will be presented, the forums will be informal and conversational, providing an opportunity for members of the UE family to engage in a dialogue about accreditation process and what to expect during the Peer Review visit. All faculty, staff, and administrators are encouraged to attend. The final HLC Open Forum will be held today at 4:00 p.m., in Eykamp Hall, Room 252, Ridgway University Center. The University of Evansville will celebrate Martin Luther King Jr. Day today, January 18. The theme for this year’s celebration is “Rebuilding the Village Through Courageous Conversations and the Initiation of Peace.” All events are free and open to the public. The schedule of events follows. The celebration starts with a rally before the University’s annual symbolic Civil Rights March on Washington re-enactment. The march begins at noon. The march returns to campus. There will be a Peace Pledge signing with free hot chocolate and coffee. Any participant signing a Peace Pledge will receive a gift. There will be a showing of the “I Have a Dream,” speech by Dr. Martin Luther King Jr.
Rev. Terry V. Atwater will be the speaker for the William G. and Rose M. Mays Dr. Martin Luther King Jr. Lectureship. A native of Evansville, Indiana, Atwater earned his bachelor's degree in electrical engineering and master’s degree in business administration from UE. He was a member of the Aces basketball team that won the NCAA Championship in 1965. In 1979, he started his own business, Midwest Engineering & Technical Services. He has been the senior minister for 40 years at North Shore Church of Christ. Panel discussion on Indiana’s Stand Your Ground Law. For more information on these events, please call 812-488-2413. Welcome back, students! We will be having the first I-House of the semester tonight at 7:00 p.m.! The topic will be the country of Syria, and the presenter is Ahmad Ismail. He is a biology major, and his favorite part about UE is that he has met so many different people. So stop on by and hear what he has to say about Syria! Make sure to mark it on your calendar. Calling all intellectuals: Nerd Wars is Tuesday, February 16! The Honors Program is hosting Nerd Wars trivia night on Tuesday, February 16, at 7:00 p.m., in Eykamp Hall, Ridgway University Center. Teams of five, consisting of students, faculty, administrators, and staff, will battle in a competition of wit while enjoying pizza, popcorn, and soda. The winning student team and the winning faculty/administrator/staff team will receive $25 MasterCard/VISA gift cards. Registration materials can be picked up in the Powell Honors Lounge or from Jayme Williams in Room 238, Koch Center for Engineering and Science. You can also register online by clicking here. The entry fee is $5 per person. Those who are unable to compose a team of five may still register and will be matched to make a team. The registration deadline is Wednesday, January 27. Any questions can be emailed to Stephen at sl192@evansville.edu or Paige at ph89@evansville.edu. Outdoor enthusiasts, come to the Venturing Crew spring open house on Tuesday, January 19, 6:00 p.m. in Room 75, Schroeder School of Business Building! You will learn about all of the upcoming activities this semester including extended outings and non-overnight events. You will have the opportunity to sign up for trips and to become a member of Venturing Crew (if you are not one already)! Please note that all payments for trips must be paid in full and are nonrefundable. There will also be more opportunities to sign up for events in the future. To become a new member, the cost is $25, and a membership and T-shirt bundle is $30. Without the purchase of a new membership, T-shirts will be on sale for $8. Nalgene water bottles will also be for sale for $9. If you are a Venturing Crew member - or anyone who loves the outdoors - we look forward to seeing you at the open house at 6:00 p.m. on Tuesday! To add to the excitement, there will be ice cream! The first PT Club meeting of the semester will be today at noon in Room 104, Graves Hall. If you are a new member or haven’t paid your dues for the entire year yet, please bring your $5 to the meeting. Welcoming a new baby into your family can bring many questions about finances. Being prepared for the expenses of the first few months with your baby, costs for daycare, saving for college, and the overall costs for raising a child can leave parents feeling stressed. That’s why St. Mary’s Hospital and the University of Evansville’s Institute for Banking and Finance are teaming up to help new parents and parents-to-be learn more about being financially prepared for a family. The next session will be Wednesday, January 20, 6:30-8:00 p.m. in the St. Mary’s Gift Conference Room. Everyone is welcome. Attendance is free but registration is required. Call Terry Cooper, personal birth consultant, at 812-485-6016 or go online to stmarys.org/classes to reserve your spot. Start off the spring semester being organized with less stress and better grades. Attend a time management and study skills workshop held in the Writing Center, Room 153, Clifford Library, today, January 19, at 6:00 p.m. Ever wanted to use a ladder on campus? All individuals who wish to request and use a ladder on campus must be ladder certified by Risk Management. Ladder training will take place tonight at 9:00 p.m. in Room 162 (Harkness Hall), Schroeder School of Business Building. Please complete this registration to finalize your participation. Participants will need to bring a pen or pencil to the training. Participants will watch a video and take a quiz. In order to get certified, participants must pass the quiz with 70 percent of the questions correct. Feel free to share this link with any UE community member that you feel would benefit from this training. If you have any questions or concerns, please contact Calvin Wertman at cw81@evansville.edu. International Orientation Leader applications available! Apply to be an International Orientation Leader for the 2016-17 school year! The IOLs are a dynamic group of students who work to welcome new international students to UE in August and throughout the year. Develop your leadership skills, share your UE experiences, and meet new UE students from all over the world! We welcome both international students and students from the United States to apply. Applications are available at the Office of Cultural Engagement and International Services on the second floor of Ridgway University Center in the Student Life Center. To be considered for the position, your application must be turned in by Friday, January 29. Any questions can be directed to Megan Sicard at ms331@evansville.edu. Since 1996 the Department of Theatre has been offering an exciting and unique opportunity to students from UE and other campuses to gain first-hand insight into Britain and its theatre. At the same time they satisfied one of their required electives by enrolling in Theatre 110 An Introduction to the Theatre. Be one of them in 2016. See as many as seven plays in five weeks, from London's glittering West End, to Shakespeare's Stratford, to professional theatres within a short drive from Harlaxton. You will get to visit the towns and cities, meet the artists, and see a varied selection of plays, both modern and classic. You will also enjoy the thrill of living for five weeks in spectacular Harlaxton Manor nestled in the English countryside while finding your own travel adventures. It was an amazing experience and a great sample of the variety of theatre. My favorite part was being able to see many parts of England and experience the culture of the towns and cities. The theatres were gracious enough to give us tours. I loved being able to see the props and all the work that goes on behind the scenes. Overall the plays I saw made me aware of how alive the theatre really is. This class has helped me to learn how to reflect on a performance and to share my opinions in a nonjudgmental environment. The single most defining experience of the class was the sense of community within our class. If interested, e-mail Joseph Flauto, professor emeritus of theatre, at jf33@evansville.edu. Starting Friday, January 15, open swim hours will be 11:00 a.m. - 1:00 p.m., 7:00 p.m. - 9:00 p.m. during the week, and 3:00 p.m. - 5:00 p.m. on weekends. 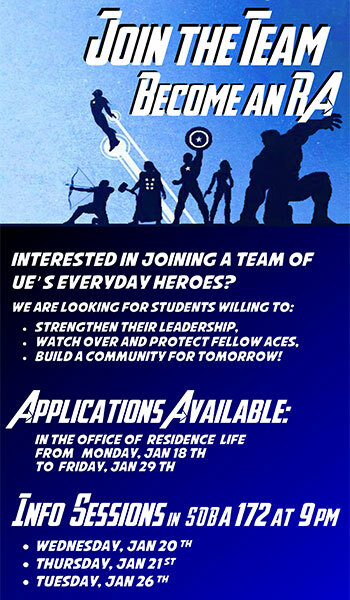 Join the team - become an RA! Applications to become an RA for the Fall 2016 and Spring 2017 semesters are available in the Office of Residence Life and online. Information sessions will be held in Room 172, Schroeder School of Business Building, at 9:00 p.m. on Wednesday, January 20, Thursday, January 21, and Tuesday, January 26. Contact Betsy Whited at ew156@evansville.edu with any questions you have! The University of Evansville, in pursuit of excellence in service, wishes to recognize a non-faculty employee displaying records of achievement as a leader. Leadership may be demonstrated in any of the following areas: service to the University, service to students, job performance, and attitude toward fellow employees. To be eligible, an employee must be a full-time member of administration or staff. Nominations for the February IMPACT Employee of the Month are due no later than Wednesday, January 20. To nominate someone, please go to acelink.evansville.edu/tools/employeeaward. Do you want to be an Orientation Leader (OL)? Apply now! We are looking for outgoing, energetic students interested in becoming Orientation Leaders! If you love meeting new people and are passionate about UE, pick up an application packet January 12-25, during business hours in the Office of the Dean of Students, Ridgway University Center. Completed applications will be due back to the same office by 4:00 p.m. on January 25. Questions can be referred to Karen Martin at km306@evansville.edu or 812-488-2500. The College of Engineering and Computer Science received Professional Engineer exam results from the National Council of Examiners for Engineering and Surveying. The PE exam passing rate for UE civil engineering alumni was 90 percent (9/10) on the October 2015 PE exam, while the national average was 66%. Over the past 10 years, UE civil engineering alumni have exceeded the national passing rate on the PE exam by about 20%. Passing the PE exam is a requirement for professional licensure as an engineer in all 50 states. Professional licensure protects the public by enforcing standards that restrict practice to qualified individuals who have met specific qualifications in education, work experience, and exams. In the United States, licensure for the engineering profession is regulated by state law. The book Ecology, Ethics and Hope (Rowman & Littlefield) was recently published and is now available in paperback. This collection includes a chapter by Lisa Kretz, assistant professor of philosophy, titled "Singing Hope's Praises: A Defense of the Virtue of Hope for Environmental Action." Senior Egidijus Mockevicius became the University of Evansville’s second-leading rebounder in program history as the Purple Aces earned a 66-55 win at Redbird Arena on Friday evening in front of a national audience on ESPN2. Mockevicius posted 20 rebounds for the third time this season to lead everyone. He also had 13 points. D.J. Balentine was the top scorer in the game with 25 points. He was a perfect 10-10 from the free throw line. Adam Wing (11) and Jaylon Brown (10) also recorded double figures. Shooting 59.1 percent in the first half, the Purple Aces (16-3, 5-1 MVC) took a 35-29 lead into the locker room at the break. Balentine finished the half with 15 points and scored nine of UE’s first 11 points, leading to an 11-11 score. Just over six minutes into the game, Adam Wing hit a jumper to give UE its first lead of the game at 13-11. A 7-0 run was capped off by another Balentine bucket. The Redbirds (9-10, 3-3 MVC) fought back and took their largest lead to that point at 23-19 at the 7-minute mark. A game of runs saw the Aces battle back. With ISU leading 27-26, Evansville scored nine points in a row, including a triple by Wing and a powerful dunk by Jaylon Brown. That gave the Aces a 35-27 lead in the final two minutes. A Nick Banyard bucket capped off the first-half scoring as UE lead 35-29 at halftime. Mockevicius scored on the opening possession of the second half giving UE a 37-29 lead, its largest of the game. After the Redbirds cut the gap to four, Blake Simmons had a great sequence to pad the Aces lead. After forcing a miss on defense, Simmons drained a triple on the ensuing possession. On the next defensive play, he forced a steal as UE pushed its lead back up to 7. Later, the Aces would push their lead to 11 at 46-35. Seven minutes into the latter period, a Brown layup gave UE the first double figure lead either team would enjoy. Illinois State kept fighting as a 5-0 run cut the gap to just six as Deontae Hawkins hit his first trey of the night. Mockevicius ended the run with a free throw at the midway point of the second half. After ISU got within four, Mislav Brzoja knocked down his first shot of the game, hitting a 3-pointer to reestablish the 7-point advantage. The UE defense picked it up from there as a 1-for-10 stretch by the Redbirds helped UE go back up by 11 at 58-47 in the final minutes. Evansville’s advantage reached 13 at 60-47 as Brzoja found Mockevicius open underneath the basket with under two minutes left. The Aces hung on from there for the win. Evansville shot 50% for the game while holding ISU to 30.7 percent. DeVaughn Akoon-Purcell and Paris Lee were the top scorers for Illinois State with 12 points apiece. It will be another late start for the Aces on Tuesday as they welcome Loyola to the Ford Center for an 8:00 p.m. contest. CBS Sports Network will carry the game. The divers on the men’s and women’s side earned victories as the University of Evansville swimming and diving teams opened up the spring season on Saturday at Saint Louis. Cory Barnes and Miguel Marcano swept the top two spots in the 1-meter dive as Barnes won with a score of 256.58 while Marcano was credited with a 213.83 to take second. Courtney Coverdale took top honors in the women’s 1-meter as her score of 269.40 was almost 40 points better than her nearest competition. Kent contributed to a 2nd place finish in the 200 medley relay. Joining her were Amy Smith, Kristen Myers, and Mackenzie Harris, as they swam a 1:51.71. Myers came in second in an exciting race in the 50 free. Her 25.14 put her in second, just 0.05 behind the winner of SLU. She followed that up with a 27.05 in the 50 fly, good for her second runner-up finish of the day. Harris registered a second place of her own as a 55.21 put her second in the 100 free. Ethan O’Rourke had a strong day for the men. Teaming up with Troy Burger, Matt Duke, and Matt Childress, the four took second in the 200 medley with a 1:37.93. O’Rourke also did well in the 50-yard backstroke, earning a second with his time of 25.02. He wrapped up the day with another second place outing in the 100 back, posting a 53.06. In the 100 fly, Prescott Marcy recorded another runner-up for the men, completing the race in 53.43. In the final team results, the Billiken women finished with a 182-92 win while Saint Louis finished with a 205-76 win on the men’s side. Next up for the women is a meet at Illinois State on Friday at 5:00 p.m. while the men’s next action will come on January 29 versus Ball State at Wyttenbach Pool. Faculty and staff will be able to pick up their two complimentary tickets to the Men's Basketball game vs. Loyola beginning on Thursday, January 14. The game will be played on Tuesday, January 19, at 8:00 p.m.
Tickets may be picked up at the Carson Center Athletic Ticket Office Monday-Friday, 8:30 a.m.-5:00 p.m. If you have any questions, please visit the Carson Center Athletic Ticket Office or call 488-ACES (2237).